M22 is an FDA-approved device that we use for treating brown spots & redness that appear on the skin, often as a result of repeated sun exposure. 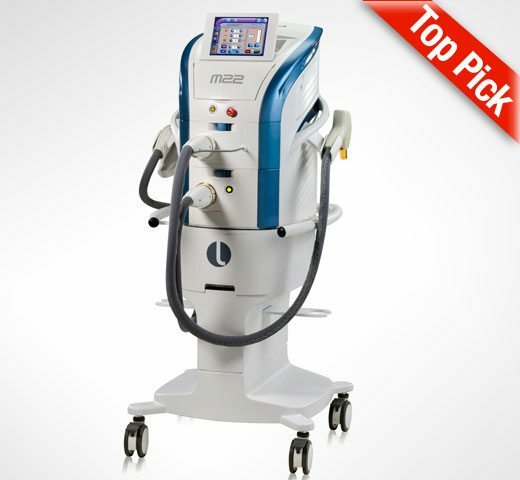 M22 is an intense pulsed light treatment, sometimes referred to as a photofacial, but it is not limited to the face and is routinely used on other parts of the body. Am I a good candidate for M22? M22 is a great non-invasive treatment option for reducing visible skin imperfections such as redness, hyperpigmentation, sun damage and more. It is also a wonderful supplemental procedure for patients who are undergoing medical treatment for rosacea. Our physicians will take several factors into account during your consultation to determine whether or not you are an ideal candidate for this procedure. What is M22 treatment like? We usually ask our patients to come in one hour prior to their treatment for “prep”. During this time we will review the treatment plan with you, take photos, cleanse your skin and then apply a topical numbing cream. The topical numbing cream will help minimize any potential discomfort during treatment. The procedure itself will take anywhere from 15-30 minutes depending on the size of the treatment area. During the procedure, a cold gel will be applied to your skin to even further increase your comfort level. After the treatment is complete, a topical cream will be applied to your skin to help calm any irritation. What are the side effects of M22? Any downtime? Side effects & downtime are mild to moderate but will depend on the treatment settings, which are directly influenced by the desired results. However, regardless of the treatment settings, you will be able to return to normal activities immediately afterwards. Most patients experience marginal redness & swelling, both resolving within hours or days of treatment. Your skin will feel like it has been sunburned, especially in the first hour after treatment. Brown spots will also begin to darken within the first few hours and then flake away on their own within 3 to 5 days. Do not try to scrub or pick at these darker spots. Redness or broken capillaries will gradually reduce as your skin recovers post-treatment. Typically results are seen within 5 to 7 days of the treatment, after the skin has recovered completely. We will assess your results several weeks after the procedure in order to determine whether or not you will need additional treatment sessions. Results are long-lasting, but not permanent. Avoiding direct sun exposure when possible and applying sunscreen on a daily basis will greatly improve the longevity of your results. We will also make recommendations on skin care products you can use in the weeks and months after treatment.